Upcycled upholstered headboard - Lovely Etc. 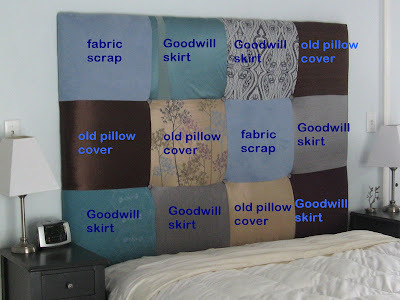 I may be the only person out there who can say I made my headboard from old skirts, dresses, and pillow covers I found at the Goodwill! What can I say, I love a good upcycled project! First, the beauty of this headboard lies in the mix of the fabric. Because the pieces are not very big, you can use whatever beautiful fabric scraps you have on hand… I, unfortunately, did not really have any beautiful fabric scraps. Nor did I have a lot of extra money to buy some. So I improvised. I bought several pretty skirts at the Goodwill and took apart a few throw pillow covers. That is how I was able to incorporate some fabrics with beautiful embroidery. I also found that foam is extremely expensive – especially foam thick enough to do some upholstering. So I got a king size foam mattress topper and folded it in half. Nice and cushy. The actual construction of this headboard was pretty straightforward. I cut all of my fabrics into squares of the same size and then sewed them together like a quilt top. 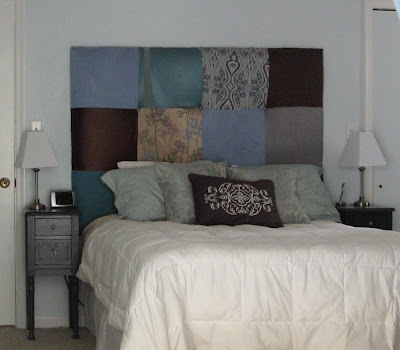 To make the actual headboard, I started with a piece of pegboard we happened to have in the basement. Of course plywood would also work. Over that I layered my mattress topper folded in half, a piece of batting, and then the fabric. I pulled everything tight and stapled the fabric and batting on the back of the pegboard. And then added the fabric buttons to each corner. This headboard is so cozy to snuggle back against it while reading in bed. You may be wondering why we have the bed on this tiny wall between the bedroom door and the closet door. While the room isn’t huge, there are certainly bigger walls. But this is the absolute perfect place for the bed, despite it’s size. There is a long screened porch running along the back of our house. It is completely surrounded by woods – not a house in sight. The bed in this exact spot, faces the sliding glass doors to the porch. Which means when we sleep here, we can wake up to a beautiful view of sunshine falling through branches. (Except when I have to get up at 5:30 for work – there is no sunshine then). Since I’ve shown you almost everything in our bedroom including the lockers, nightstands, and bed, I thought I would also share the last major piece of furniture. This vanity is the reason I did not need the other vanity that became the nightstands. (Did you follow that?) Last winter my mom called and told me she saw a bed and dressing table on the side of the road (laying in the snow). When I went to rescue them, I found this beauty. I have not done a single thing to it, except add a new mirror. (The bed that was with it is still in the basement awaiting a makeover). I love it. And it makes me feel a little sick that someone was going to just throw this gorgeous thing away. What if I hadn’t come along and saved it – terrible! Thanks! I think adding some white is a great idea. A nice white frame would probably really finish it off.